This time I got mine from my local Whole Foods. I was so excited about these little munchkins that I also picked up some white truffle oil, to create something special and delicious. Back home, I looked into my pantry and fridge to see what I could cook. I settled on a risotto - Comfort Food No. 2. Sometimes I know when I'm going to make a fabulously successful dish - or not. It's probably to do with my excitement and attitude, and it’s just one of the things I'm learning about myself and cooking. 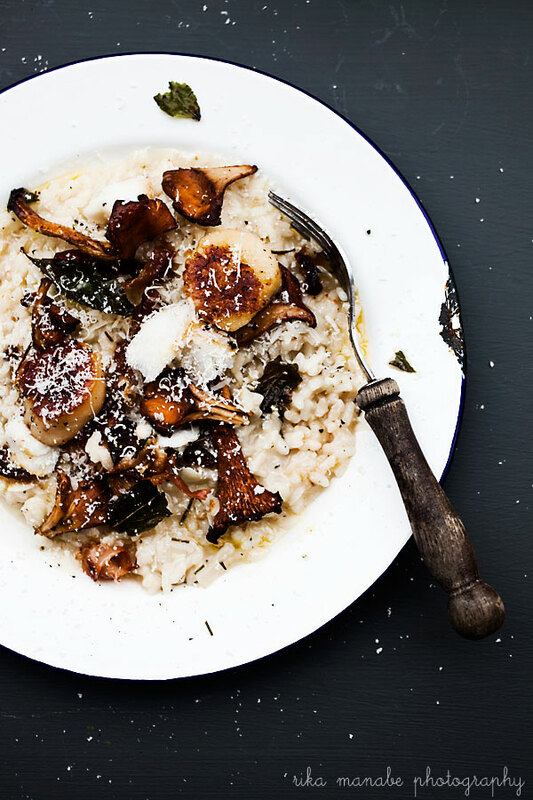 With this risotto, I'm in to win. First I oven roasted the mushrooms and a few cloves of garlic, with a sprinkling of salt, pepper, olive oil and rosemary. The smell in the kitchen was incredible already. Then I pan-seared some sage leaves and prosciutto in olive oil, and some meaty scallops, for about five minutes. I like to eat scallops raw at sushi restaurants, but I don't usually cook them. So I wanted to be careful not to mess up this part with my lack of scallop skill and experience. In the end, it went quite well. By this time, the rice was also cooking, and the soup stock was heated and ready to go. I had all the right ingredients for this dish. I didn't even have to try hard to make it, which is something I really enjoy. Occasionally I have to try so hard to come up with something to make, not just for the blog, but also for dinner parties and kids’ meals. But sometimes, despite the effort, it doesn't always turn out so good. 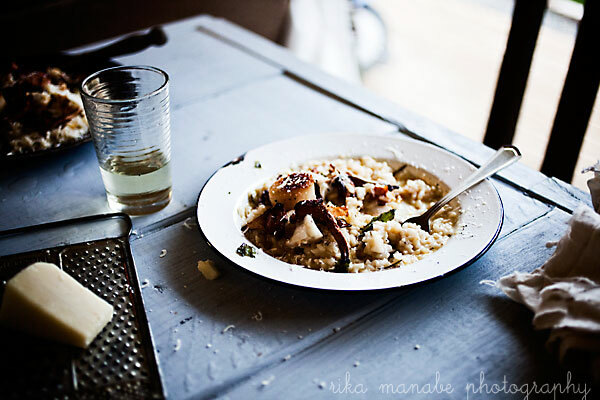 With this dish, though, I got a little taste of effortless success, even if I say so myself. For the finishing touch, I drizzled a little white truffle oil and grated some fresh parmigiano reggiano - very satisfying. Definitely one of top five foods I've ever made. My hubby agrees. The kids don’t. They are 4 and 2, so they can't appreciate the sophistication of this dish, but your date or friends definitely will be entertained. Heat the oven to 400°F. 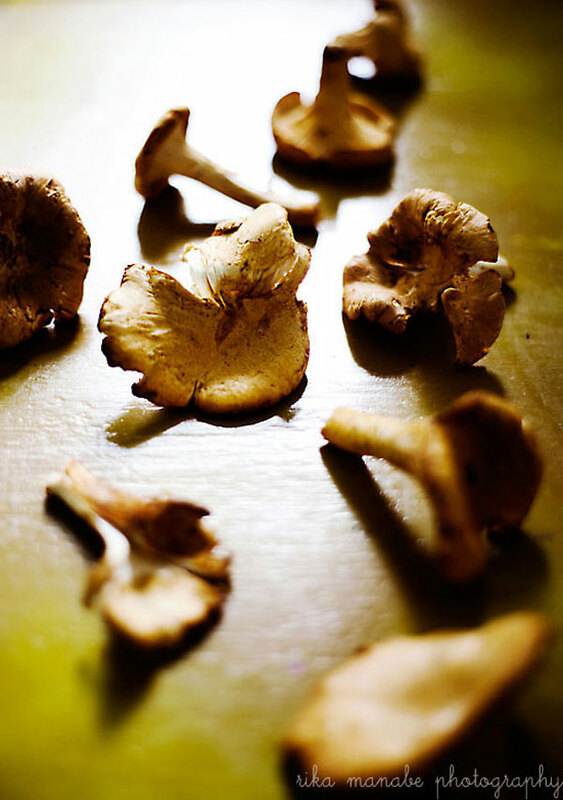 Clean the mushrooms with a dry cloth and place them on a cooking sheet with the cloves of garlic, 2 tbsp of olive oil, salt and pepper. Bake for 10-12 minutes. Heat the broth in a pan and leave it on the stove, but without letting it boil. In a heated pan, pour 2-3 tbsp of olive oil and cook the prosciutto with the sage. 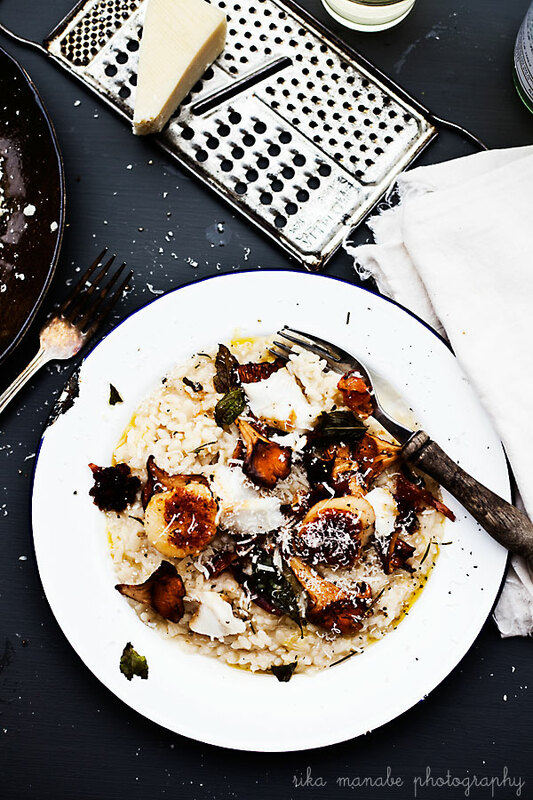 Sprinkle a little salt and pepper on scallops and the cod. Take the sage and prosciutto out when they become crispy, then satay the seafood on a medium-high heat, two minutes for each side. Splash on a little white wine. Pour 2 tbsp of olive oil into a heated pan. Satay the minced shallots and add the rice. Add a cradle full of soup, and cook until all the liquid is gone. Repeat the process until the rice is cooked al dente. Make sure the rice is still soft before taking it off the heat. Add a knob of butter and serve on a plate. 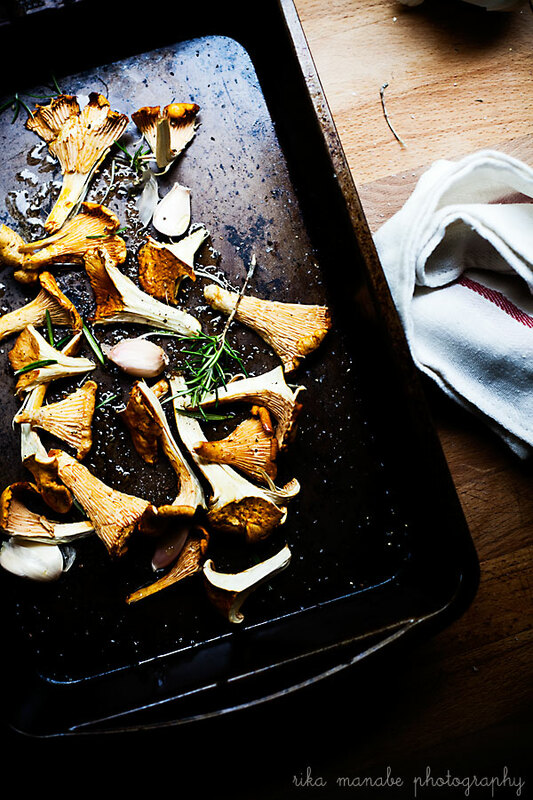 Top the dish with the seared seafood, roasted mushrooms, and crispy herbs. Serve with a dash of truffle oil and grated parmigiano reggiano.